In the course of my research project, the Singularity, the absolute favorite of all the fast-growing industries I uncovered was robotics. More specifically, industrial robots and cobots that will be a major part of manufacturing in the future. I believe that the robotics industry will be much larger than most now foresee. That will translate to massive profit opportunities for us investors. The reason is straightforward. Companies will continue to find that the introduction of collaborative robots or cobots, which are relatively cheap and easy to ‘train’, will raise the productivity and the profitability of their operations. But without causing massive job losses. Researchers at MIT found that robot-human teams were about 85% more than productive than either humans or robots alone. And Søren Peter Johansen of the Danish Technology Institute says that automating the simplest 80% of a production process is significantly cheaper than a fully automated solution. The remaining 20% of the work will be done by human co-workers. This line of thinking is backed up by the fact that the global automotive industry has been a major adopter of robot technology. Yet, employment in the industry is still rising. Adding robots to the workforce will turn out to be a win-win situation. The prior generation of an average industrial robot cost about $120,000 to install. That served as a damper on the growth of the industry. But now, the next generation of industrial robots – collaborative robots – cost only about $35,000 to install. And with little time needed for ‘training’, unlike the old-school robots that needed a programmer to set it up. The old-school robots have been used mainly by the auto industry, with little uptake from other types of manufacturers. I don’t have to tell you that this means there is a very large remaining market that is wide open for the introduction of next-generation cobots. That line of thought is supported by a study from Research and Markets that forecast that the cobot market will grow by more than 40% annually over the next five years. This growth will be sped along by the continuing drop in price for this type of industrial robot. According to research from ARK Invest, by 2025, costs for robots will drop by about 65% to only $11,000. All thanks to technological advances in machine learning, machine vision and connected sensors. Not surprising to me is that China is leading the way in this robot revolution. Annual sales volume has already hit the highest level ever for a single country, as 2016 sales of industrial robots surged 27% to 87,000 units. The surge is slated to continue according to the International Federation of Robotics. This industry organization forecast that, from 2018 to 2020, sales of robots in China will jump between 15% and 20% annually. The main driver of this growth in China is its electrical and electronics industries. In 2016, sales to this sector soared 75% to nearly 30,000 units. Among these industries are the semiconductor and battery manufacturing sub-sectors, which the Chinese government has focused on as crucial to its economy’s future. And while some robot sales went to domestic robot makers, the door is wide open for robot manufacturers from around the world. That can be seen in the data from Japan that is home to some of the world’s top robot manufacturers. Data from the industry group, the Japan Robot Association, showed that China-bound exports of industrial robots surged 48.3% year-on-year in the first quarter of 2017. 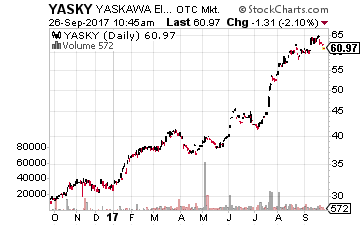 This has not been lost on shareholders of Japanese robot maker Yaskawa Electric (OTC: YASKY), which has doubled in price this year. In addition to industrial robots, the company manufactures servos, motion controllers, AC motor drives and switches. The company has a rich history in robotics, introducing Japan’s first all-electric industrial robot all the way back in 1977. The MOTOMAN line of industrial robots continues to this day. Yaskawa is moving ahead in China. It is expanding production lines at a plant in Changzhou with the aim of doubling local monthly output to at least 1,200 units by the end of the decade. 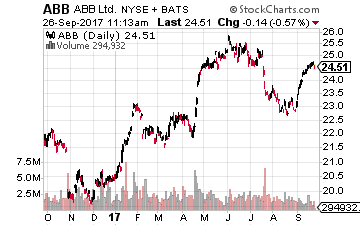 Another company running hard in the race to build robots for China is the Swiss industrial technology powerhouse ABB Ltd. (NYSE: ABB). The company is divided into four divisions: robotics and motion, industrial automation, electrification products and power grids. Focusing in on its robotics division, ABB is accelerating its expansion in China with plans to double robot production capacity. Part of that plan involves doubling the number of robotics research employees in China. This major push into China is all part of ABB’s management strategy to surpass Japan’s Fanuc (OTC: FANUY) as the world’s largest global provider in robotics and automation. The company also would like to take the lead in China in providing the necessary infrastructure (supplying charging stations) for electric vehicles. You may wonder whether falling prices for robots will adversely affect these companies. Based on history, the answer is no. During the past decade, robot prices have dropped by about 40%. Yet, gross margins for companies like ABB, Fanuc and Yaskawa have actually been stable to improving. 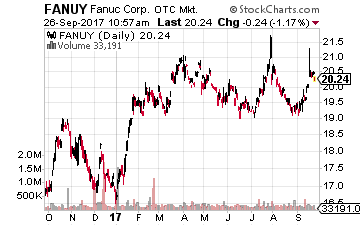 For those of you looking for broad exposure to robotics and not single-stock risk, there are two ETFs that should suit you. These are the Global X Robotics & Artificial Intelligence ETF (Nasdaq: BOTZ) and the Robo Global Robotics & Automation Index ETF (Nasdaq: ROBO). 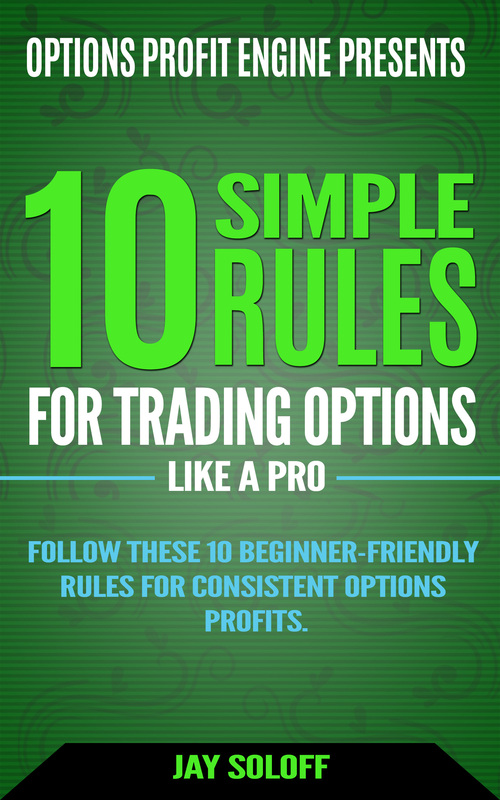 While there are some differences in the portfolios, I am a fan of both funds. And there is some overlap in the two portfolios. Both funds do have Yaskawa Electric as well as Japanese companies Keyence (OTC: KYCCF) and Omron (OTC: OMRNY) in their top ten positions. Whether you opt for a fund or individual stocks, robotics is a must-own sector for the years ahead. Disclosure: I own shares of Yaskawa Electric.